So my birthday was on Wednesday and I told Peter that all I wanted was a day off. 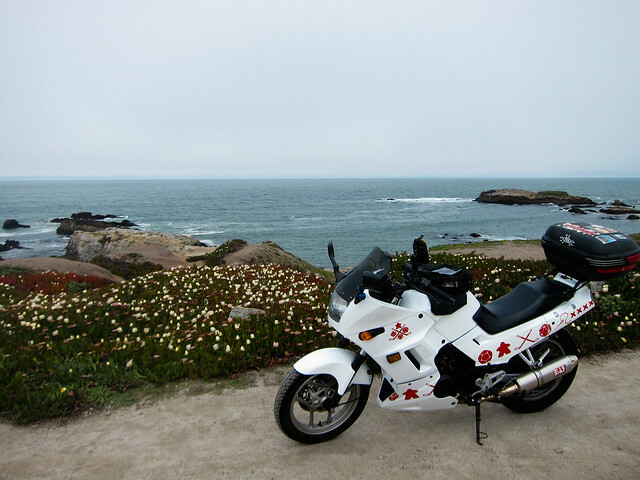 Â I wanted nothing to do with any children all day and I wanted to go for a motorcycle ride. I started the day, as per usual, at the Depot Cafe for breakfast. 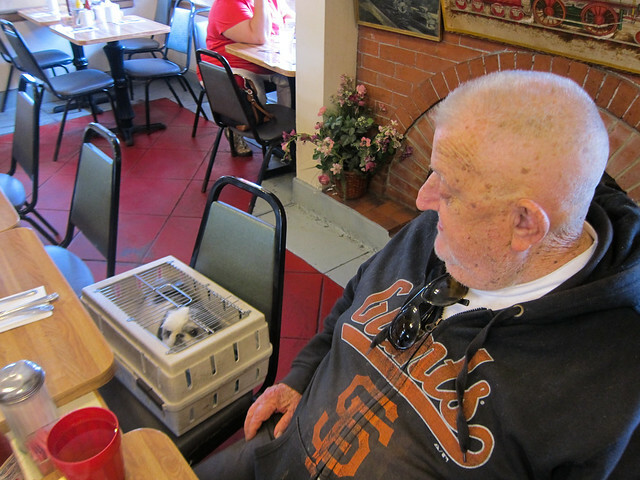 Â Good food and good conversation with Don and Little Bit, two other regulars. Â They’re there pretty much every time we ever go to Depot Cafe; I’m convinced they live there. 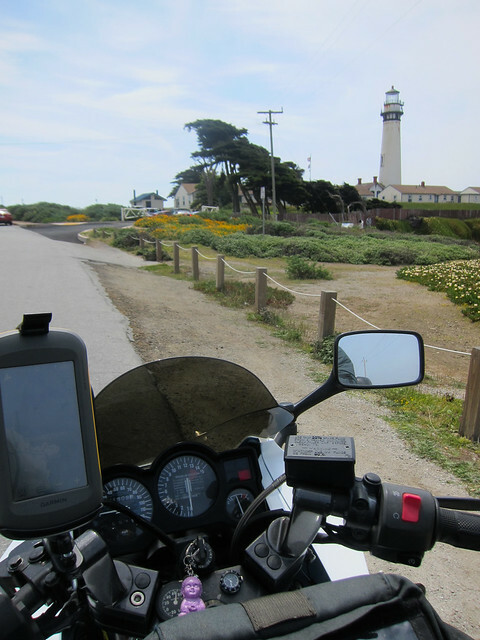 I headed straight over to the coast. 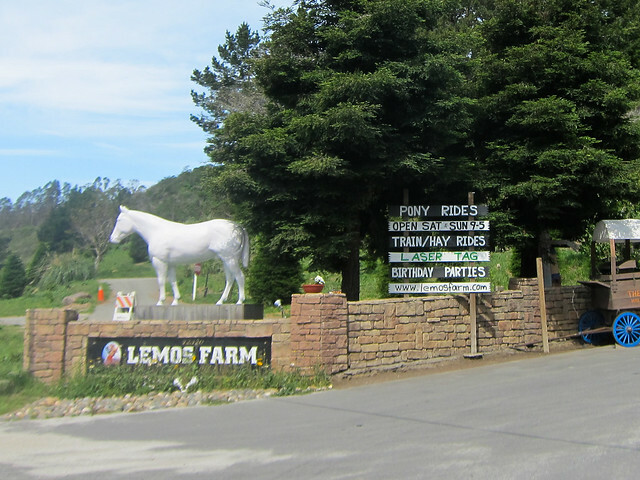 Â The Lemos Farm horse was resplendent in its primer today; no horse mural for me. Â Unlike last time, when I found the naked horse unsettling and ghostly, today I found it optimistic and full ofÂ opportunity. Â I’m sure my therapist would have a great time with that. 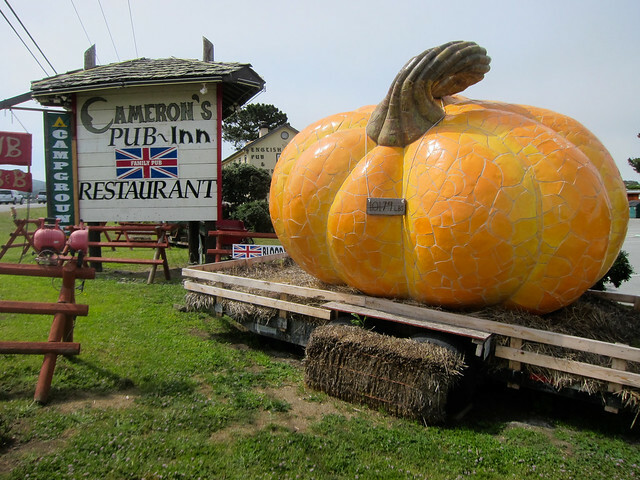 Cameron’s Pub now has a giant replica of a giant pumpkin, because of course it does. My first stop was along Stage Road to watch the fog roll in. 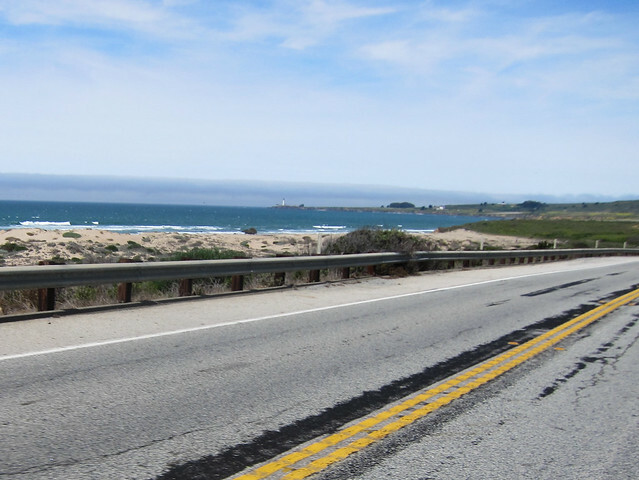 I continued south along the coast, despite the fog. 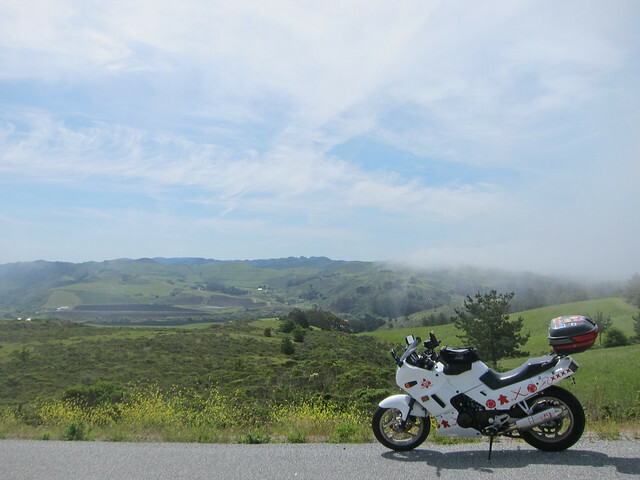 Â It was a gorgeous ride and a fun time despite the falling temperatures (it felt great compared with the 90+ days we had on the Peninsula the last couple of days!). 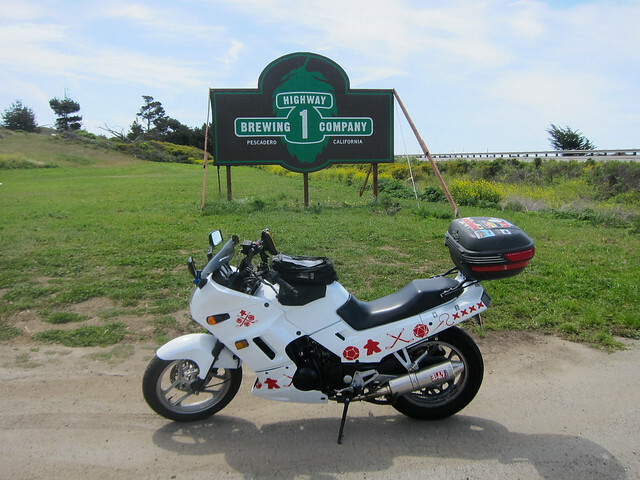 As I was heading towards Davenport, I was idly thinking about what to do about lunch when I saw a “Brewery Ahead!” sign. Â My interest piqued, I was surprised to see that the Gazos Creek gas station is now neighbor to the Highway 1 Brewing Company! Â Holy crap! Â That is made of awesome. Â Of course I stopped. 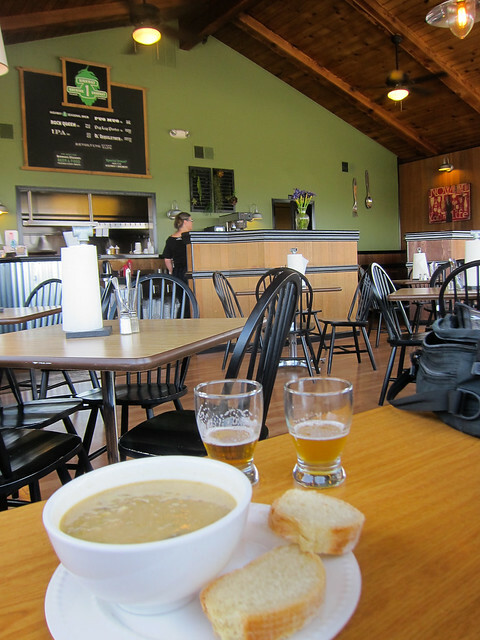 I had a big cup of their homemade potato leek soup and bread, plus a free 1 oz sample of their Rock Queen pale ale and the seasonal hefeweizen. Â Everything was great and I will definitely be back. 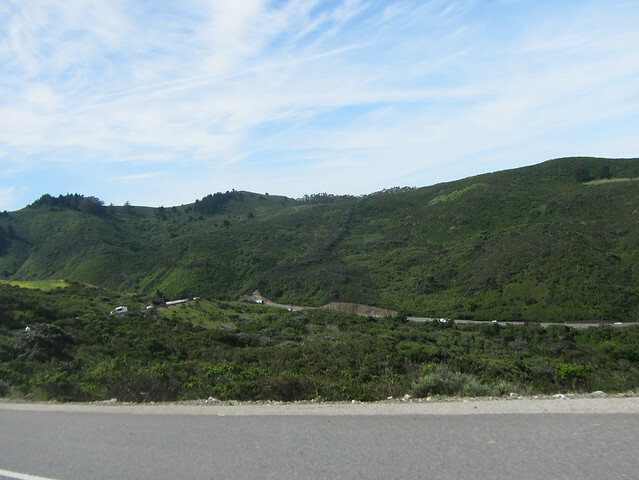 Â Now I’ll have a hard time on coastal rides trying to decide between Cameron’s, Duarte’s, and Highway 1 Brewing Company. Â Verily, my life is rough. 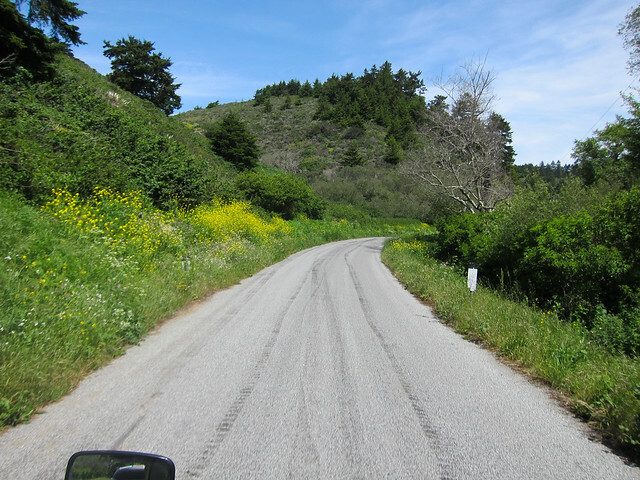 I headed inland on Gazos Creek Road, thenÂ Cloverdale Road (I’m not honestly sure which portion of the road I took this photo on). 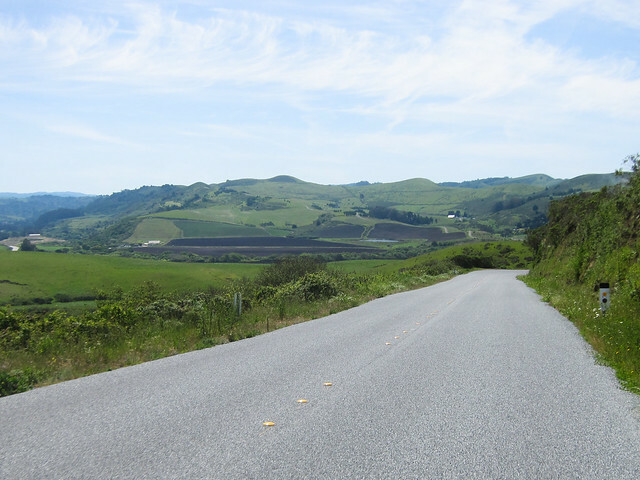 Â I had my usual postpartum unease about narrow roads — something about birthing babies makes me utterly convinced that a pickup truck is going to come around a tight corner at 50 mph and splat me — but these roads are gorgeous nonetheless. 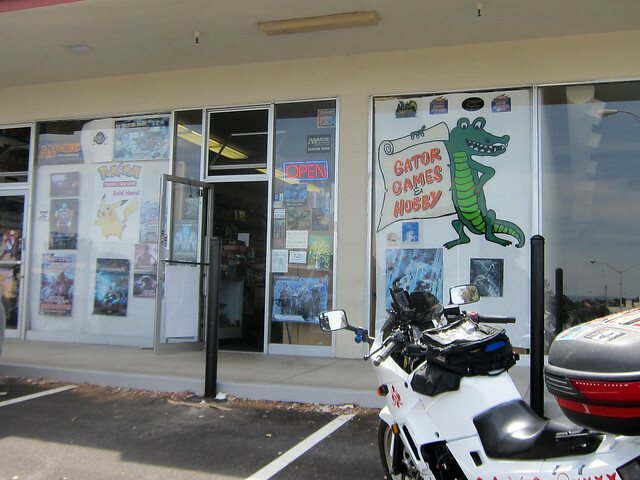 ….and then it was back into civilization to swing by Gator Games to pick up a game I’d ordered that arrived in stock. 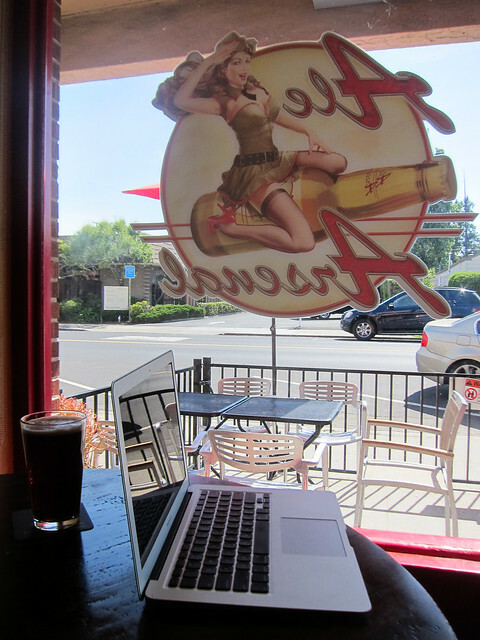 Next it was off to a pedicure, which I didn’t photograph, and then a long jaunt at the Ale Arsenal to let the pedicure dry and do this blog post. Â Yes sir, it’s a rough life. 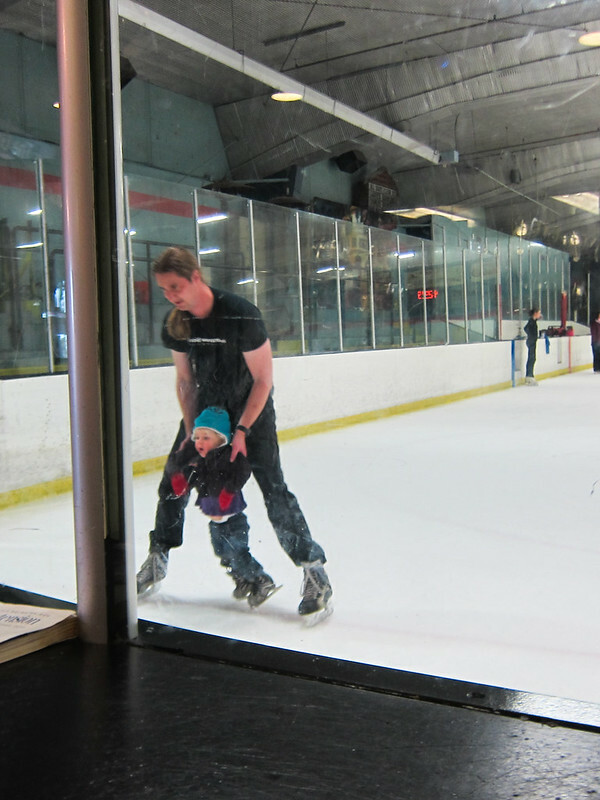 I had thought I was doing OK with no days off until I took a day off. 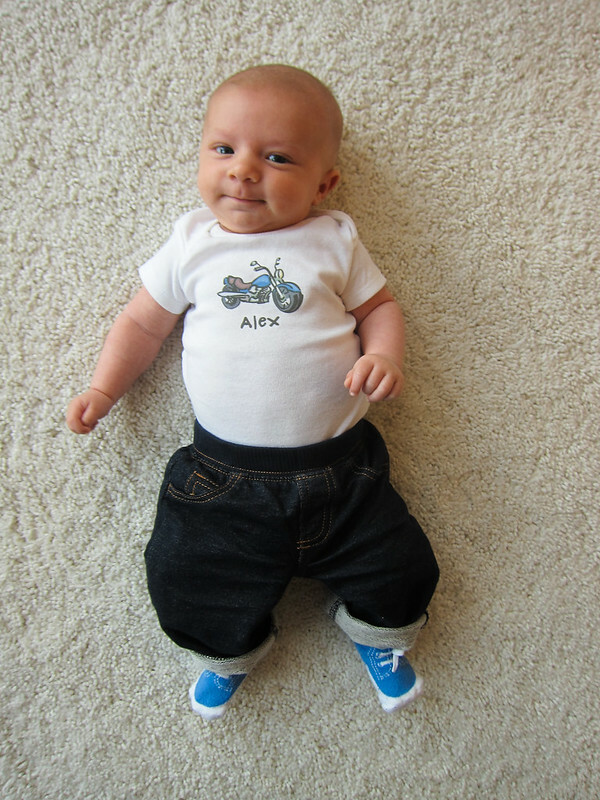 Â Now I’m pretty much convinced to start Alex at daycare one day per week. 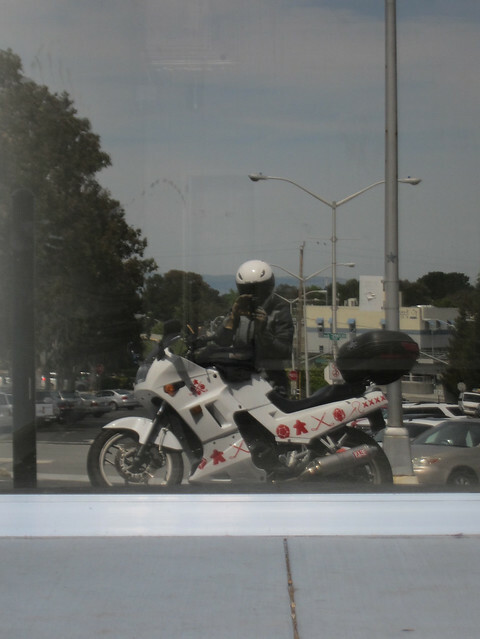 Â I won’t always take motorcycles rides (sometimes I’ll do exciting and decadent adventures like….going to the dentist alone! Â *clutches pearls*) but I need the time to feel like a human again instead of just a harried mom. 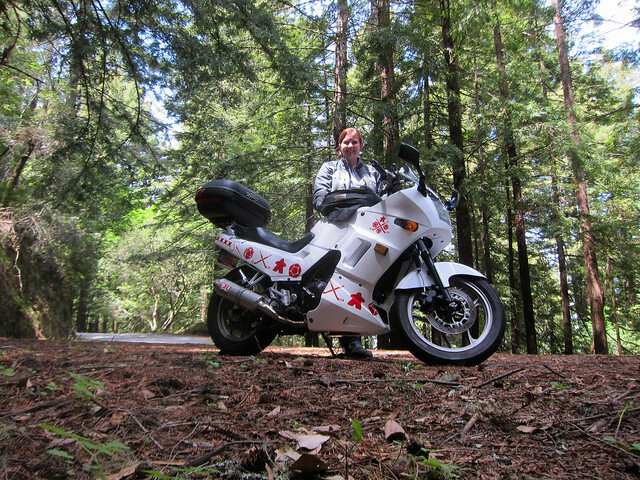 Â But that’s more for the “mom motorcycling” categories and thus another blog entry. On that note, I need to leave the Arsenal and head home to shower and get ready to go out to dinner with Peter. Â Hooray for birthday day! Oh, hello there! 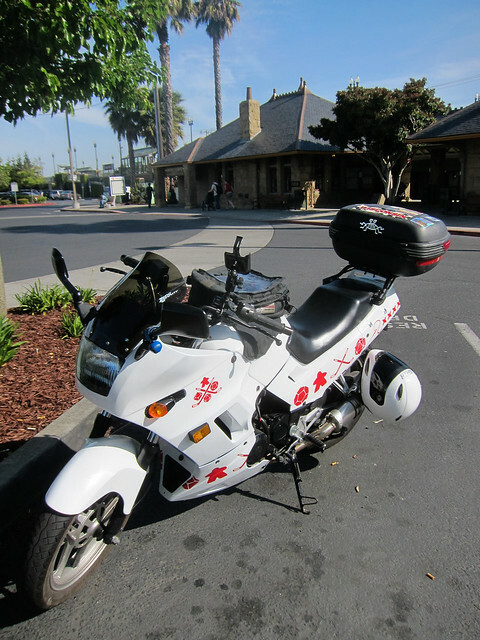 Â I rode the Ninjette last night for the first time since….July? Â August? Â I honestly can’t remember. Â A long time, at any rate. Â It wasn’t a very exciting ride: just down to Redwood City for my biweekly board game night. Â But it was a motorcycle ride! And riding the bike came back to me just like, uh, riding a bike. Hey! What do you think of the Ninjette? Â Snazzy, huh? Â The paint was done by Bobby at CycleFinish; he did an amazing job and I would absolutely recommend him. Â You can’t tell in the above photo but the white is a sparkly pearl white. Â I’m hoping it comes through in sunlit pictures because it really has a nice depth in person. 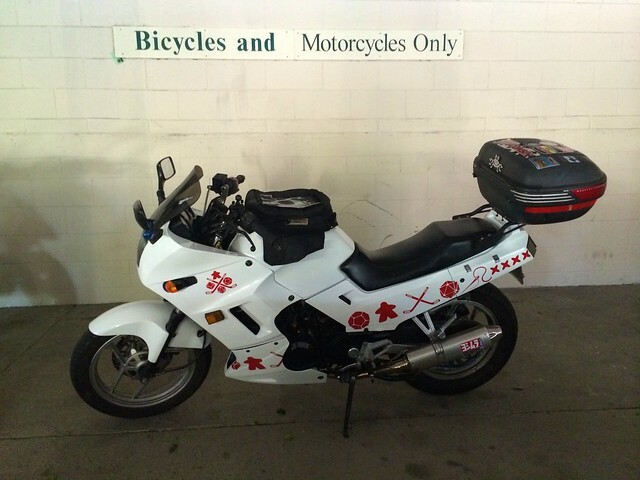 The decal art was done by my awesome friend Michelle and the decals themselves were printedÂ by Jeff at Schoen Signs. The art is hopefully fairly self-explanatory but just in case you’re new here (and heck, it’s not like I’ve been around much lately either): they’re gaming dice (d10, d12, and d20 in various locations), a board game Meeple, hockey sticks, and a needle/thread for cross-stitching. 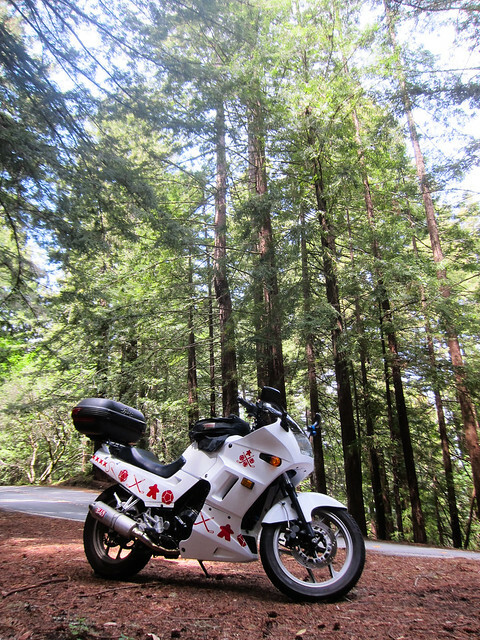 Â My other big hobby is, of course, motorcycling, but I thought it mightÂ be needlessly meta to use my motorcycle to tell people that I like motorcycling. On that note, I’m off to watch my Sharks hopefully not screw up Game 7 too terribly badly. 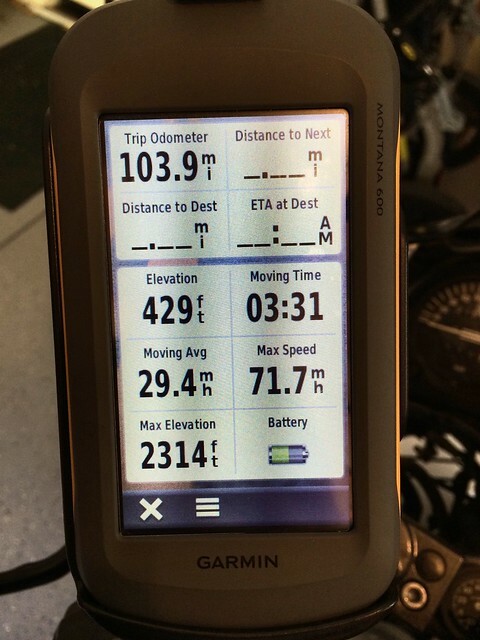 Â And, to whet your appetites….I’m going riding on Friday. Â Yep! The photo was requested by my goofball friends on the motorcycling interwebz, so I figured as long as I was being silly, I’d share with everyone. 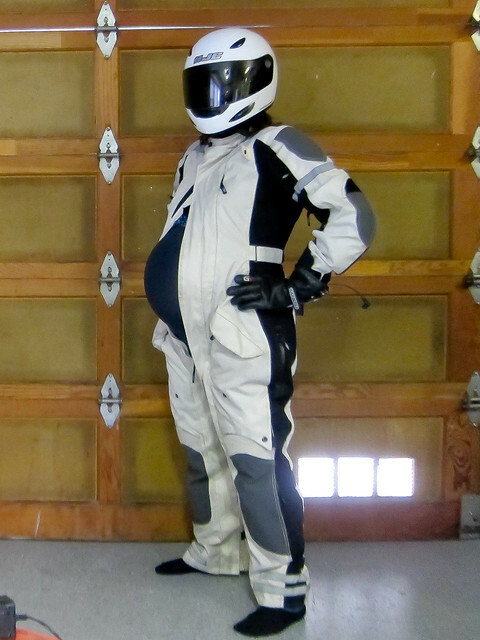 Just in case anyone was curious, it is not super easy to get a one-piece armored suit on when one is over 39 weeks pregnant. Â The boots were absolutely not happening whatsoever. But, y’know, other than that, I think it’s a good look for me.